Protect the environment and pay less in property taxes! Forestry exemptions provide property tax assessment reductions to encourage forest preservation by decreasing the expense of holding land. The rules regarding these “exemptions” vary from state to state, but the principle is the same: in exchange for forest guardianship, owners of sizable parcels of land receive a break on their town and school property taxes to reflect land usage rather than potential value. Depending on your state, the size of your property, and the density of the forest you could qualify for what is known as a “forest exemption.” It won’t “exempt” you from paying taxes, but it will decrease your tax burden. Maybe it should be known as the forest discount tax plan. Until the end of the nineteenth century forests were cleared for agricultural usage, chopped up for charcoal production, or lumbered off for timber. Massive Catskill hemlock stands were cut down for their bark used in the tanning industry. Forests and trees were a nuisance that stood in the way of settlement, or a natural resource to be exploited. Forests in the northeastern states had all but disappeared by the end of the nineteenth century when the European concept of managing trees as a renewable resource was introduced. Tree seedlings started to be planted where loggers had left barren ground and farmers had abandoned farms with depleted soil. Areas were reforested with conifers for watershed protection, flood control, and future timber protection. This was before anyone thought of the additional benefits of sequestering carbon, preserving wildlife habitat, or fighting climate change. 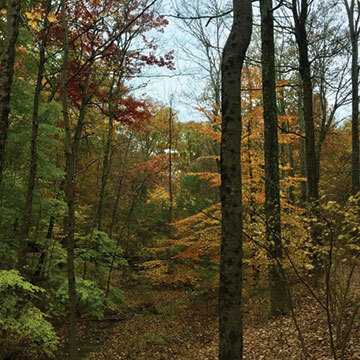 To encourage the protection of privately held forestlands, New York, Massachusetts, and Connecticut have instituted broadly similar programs creating tax relief for owners of forested lands. All three states require a certain minimum acreage, a forestry management plan, and a ten-year commitment to maintaining the forest – but the details and tax reductions vary. Anyone that is potentially interested should contact an approved state forestry expert to first do an initial assessment and figure out if the tax savings are worth the commitment. New York State, with its heavily forested Catskills and Adirondacks, has over 19 million acres of forested land, 75% of it is in private hands. In 1977 New York passed Section 480a, which established the rules for forestland exemptions. The minimum size is 50 contiguous acres all owned by the same entity. This required size eliminates more than half of the privately held forestland. Owners must retain a registered forester to evaluate the tree stand and prepare a ten-year management plan which is then approved by the NYS DEC, which, in turn, notifies the local assessor that the plan has been accepted. The assessor then reduces the assessed value of the forested acres (see chart). Only wood fiber is considered a crop and other forest uses like maple syrup, recreation, and Christmas trees are excluded from forestry exemptions, but could be covered by an agricultural exemption. The downside in all of these programs is that rollback tax penalties are applied for partial or total change of the land use. In New York enrollment constitutes a lien on the property and the next owner would be obligated to continue the plan for nine years or pay penalties. It’s important to know if you are obligated to follow an existing forestry management plan before you buy. In practice, New York State forest exemptions, which are supposed to reduce assessed taxable value by 80%, can vary enormously. A small, random sampling of raw land parcels with forest exemptions in Dutchess County shows a huge variation, both in assessed value of forest lands from $16,000 an acre to $6,266, and a value per acre after application of the forest exemption between $12,000 and $1,700! In many ways Connecticut’s regulating Act 490 (passed in 1963) is more generous than New York’s and now covers almost 500,000 acres. PA 490 requires only a minimum of 25 contiguous acres and currently values forest land at $240 an acre for tax purposes. Contrast this to the values of protected forests in Dutchess County. Less densely settled towns often have substantial forest exemptions that can constitute a painful hit to the town’s tax base. For example, the town of Cornwall alone has 14,000+ acres of protected forestland, which reduces property tax collections by over $2,000,000 every year. Like New York, a forester’s report is required; however, it is the town assessor who determines eligibility – not a state conservation agency. In Massachusetts over 500,000 acres of forests are covered under forest stewardship programs 61, 61A, and 61B. Unlike New York, Massachusetts only requires 5-10 acres of land to be considered, and there are less severe penalties for getting out of the program. Every year the state establishes the value of forest acreage for property tax purposes. Currently this is a little under $100 an acre for 61A, which the assessor applies to the property assessment. If a forest is registered as recreational under 61B, property taxes are reduced by 75%. Massachusetts further gives landowners flexibility in switching between managed forest plans under 61A and recreational forests, which can just be left natural habitat and not managed. If you are an owner of substantial forest acreage or are considering buying forested acres, the impact of the forestry exemption can affect the value of the land. If you buy land with an exemption in place, you should determine the requirements and limitations. Everyone should understand the complex rules about annual renewals and dates for the paperwork. Once you recognize the opportunity or the risk, you should consult with a registered forester with your state.